We just arrived in Suriname after we have seen the start of an ARIANE 5 Rocket launch in French Guiana. More pictures here. Suriname is an example for United Nations. The population is from India, China, Indonesia, Europe etc. and all live in peace and harmony together. 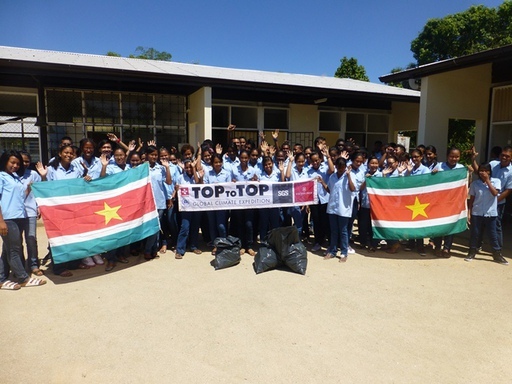 TOPtoTOP made a presentation and a clean up at the High School in Domberg. 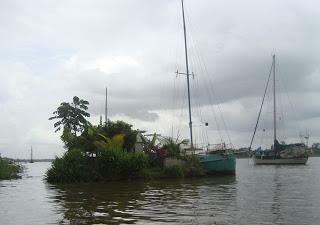 After 200 nm we went up the Suriname River for about 60 km and met Sofia and Ed in Domberg. Sofia and Ed sailed here 6 years ago and found the shore full of plastic bottles. They decided to clean up the place and use the bottles to build an island. On the island they planted trees and vegetables and build their cabin. We just arrived in time to meet them. 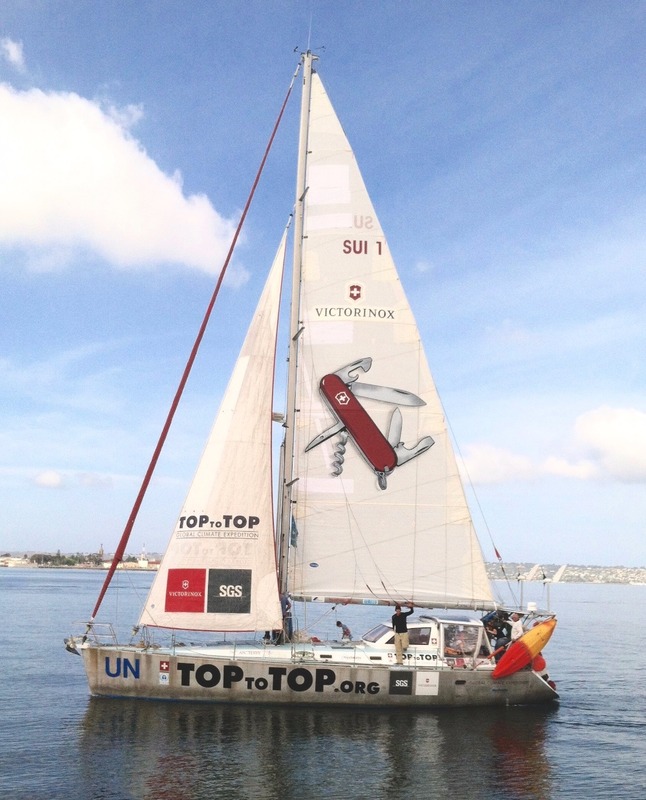 Tomorrow they sail off again to the Corrantijn River to do another plastic recycling project. They teach the ladies how to turn plastic bags into art and useful bags. More pictures here. Congratulation to Sofia and Ed. See more here. Some press in Dutch. “Ed and Sophia, a Dutch couple, living in Suriname, “have built a floating island, using great creativity and energy, callling attention to the masses of plastic that are discarded in our oceans. “The Domburg Bottle Project,” begun in November 2006, used approximately 150,000 discarded plastic bottles, sewn into five large pockets of old fishnet. The final island is approximately 10 by 7 meters, and 1.5 meters thick. On that, they deposited large amounts of topsoil, and have planted trees, flowers, grass and vegetables. Frequent rain keeps the island green, augmented when necessary by water from the river.” …and more from Rob and Natalie’s blog.